Two men have been jailed for six years after a gun and ammunition were thrown from a car near a pub in Manchester. 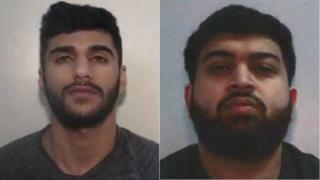 Aqeel Ilyas, 22, and Salman Gull, 24, were being followed by National Crime Agency (NCA) officers and abandoned the weapon on 28 July last year. Gull then fled to Pakistan for three months but was arrested on his return to Manchester on a flight from Lahore. Both pleaded guilty to possessing a prohibited firearm and ammunition with intent at Manchester Crown Court. Ilyas and Gull were seen driving a white VW Passat at 21:30 BST in the area of Allama Iqbal Road in Oldham, said the NCA. Officers followed but did not realise that a firearm and ammunition had been thrown out of the car window near the Fiddlers Green pub off the A6 in Levenshulme. The gun was found by a member of the public and handed in. NCA officers arrested Ilyas at his home in Kempton Road, Burnage the following month and Gull, of Wilbraham Road, Chorlton after he landed at Manchester Airport in October. Andrew Etherington, NCA Operations Manager, said: "This was an extremely serious offence whereby a firearm was thrown from a car as it drove down a busy road. "We know that firearms are strongly linked to criminal gangs who use them to enforce control and ultimately fuel serious violence. "Every gun we take off the street will protect the public."